Mentally ill inmates who are able to shower, eat, sit quietly and otherwise care for themselves live in the jail's Division 2. A psychologist is stationed right outside the room, and officers are specially trained to deal with psychotic episodes. 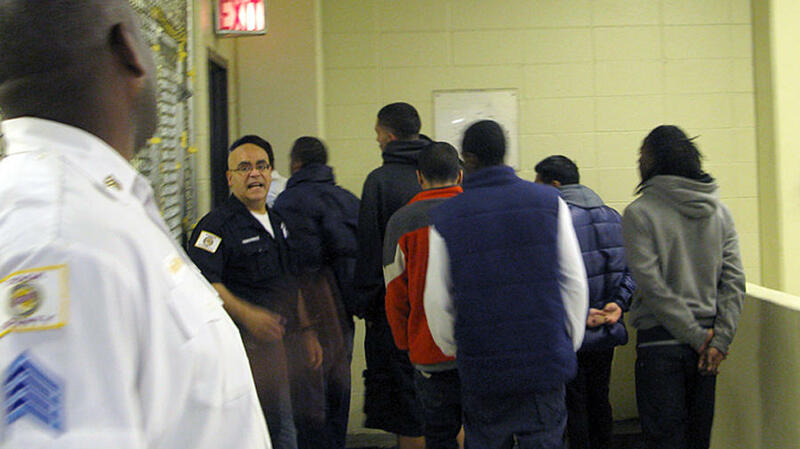 Cook County Jail inmates head off to bond court after being screened for mental illness. If they then don't get released, the jail will separate the mentally ill from the other inmates. Elli Petacque Montgomery with the Cook County Sheriff's Office assesses a new inmate for mental illness. Cook County, Ill., Sheriff Tom Dart walks the halls of his jail every day. With 10,000 inmates, this place is a small city — except a third of the people here are mentally ill.
Dart has created some of the most innovative programs in the country to handle mentally ill inmates, hiring doctors and psychologists, and training staff. But if you ask anyone here, even this jail is barely managing. "I can't conceive of anything more ridiculously stupid by government than to do what we're doing right now," Dart says. Fifty years ago, states began shutting down asylums in favor of community mental health centers. It was a major policy shift in mental health, allowing patients to go home and live independently. Over the past decade, though, states have cut billions from their mental health budgets, shuttering clinics across the country. The result is thousands of mentally ill people funneling in and out of the nation's jails. In many cases, it has sent the mentally ill right back where they started — locked up in facilities that are ill-equipped to help them. You can see the problem every morning in the intake center in Cook County, where 250 new inmates, arrested overnight, are stuffed into bullpens. Elli Petacque Montgomery is the deputy director of mental health policy for the sheriff's office. She and her staff screen all of the inmates for mental illness. It's not the hostile, angry men at the front of the cages, bickering with jail staff and pushing each other for more elbow room that interest her. It's the men in the corners — men who come to jail and manage, despite the noise and commotion, to fall asleep. "I'm kind of curious about this guy in the blue," says Montgomery, pointing to a man sitting quietly on a bench. "Now, is he dazed because he's on drugs or because the voices in his head are louder than what's happening around him?" On this morning, one inmate after another has a problem. One man tells her he's going to kill himself because he thinks he's already dead. Another guy explains that the voices tell him to hurt people. "To walk in and feel like every other person I'm interviewing [is] mentally ill on any given day, I can't wrap my brain around it," she says. "It's staggering what we're really dealing with." Most of these men are here on minor offenses. Police have picked them up for small crimes like acting out in front of restaurants, sleeping in abandoned buildings or possessing drugs. They're people with nowhere to go and nowhere to get medication. Some of them will stay for a few days; some for a few weeks. But statistically almost all of them will be back. While these men are here, the jail's responsibility is to keep other inmates from hurting them, and them from hurting themselves. But jail staff say what really happens deep inside this jail is a far cry from actual treatment. Inside the women's psych ward — a place rarely seen by the public — a long, sterile hallway with a row of green doors leads to a community area where 20 women are sitting in chairs. Some are rocking; some are pulling out their hair. Many are staring into space. "You see people who are so profoundly ill that you understand that this is not the place for them," says Dr. Nneka Jones Tapia, head of mental health for the jail. But here and throughout much of the country, there's nowhere else for them to go. City and state governments nationwide have cut funding for mental health services. In the face of budget shortfalls, Chicago officials closed six of the area's 12 mental health clinics in the past three years. Illinois officials closed three of the area's state hospitals. Private clinics are also struggling for funding. 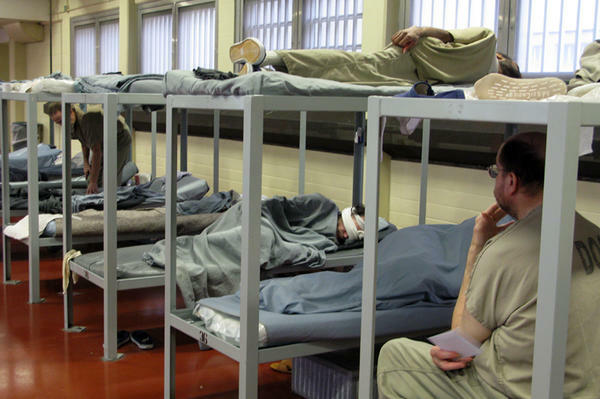 Without medication or counseling, these inmates wind up in front of police. They're brought here to this ward, which resembles something from the past. The jail's chief psychologist, Kenya Key, steps inside a small, dark room behind the community area. It has padded walls, a drain and a light — nothing else. It's called the quiet room. "It's never used as punishment," Key explains. "The purpose of it is to decrease stimulation." There's nothing to write with in this room, but the walls are covered in writing — slurs written with blood from fingertips or scratched into the walls with fingernails. "The majority of the patients who are put here are in a state of very high agitation and escalation," Key says. "While we do have those patients that will ask, 'Can I go to the quiet room?' [with] the majority of patients, it's a forced intervention to help the patient de-escalate." In the men's psych ward down the hall, the scene is similar. Some men are locked into rooms where they pace back and forth for hours in smocks. One man is wearing just a blanket. One man had been tied down in an empty room during the night with leather straps. "Full leather restraints are used when a patient does not respond to any other intervention," Key says, "which means they are literally restrained to the bed." Officials acknowledge that what's happening in these wards is reminiscent of the mental asylums of the last century. But they say the only other option is to lock the mentally ill in solitary confinement for weeks on end. This is, after all, a jail. And this is one of the few in the country with doctors and nurses, psychologists and correctional officers trained in how to handle psychotic episodes. And there are rules: Inmates can only be forcibly medicated with a doctor's orders. Leather restraints and padded rooms have time limits. Still, Sheriff Dart says he's confused by the compliments he hears from other jail administrators. "On the one hand, they're speaking so highly about what you're doing," he says, "but it's depressing as hell when they tell you you're the leader. I feel as if we're doing the bare minimum, and we're the leaders? No, this is not good." The confusion about what is supposed to be happening in this jail is apparent when correctional officers talk. They often switch between calling the men inmates and patients in the same sentence. Once inmates are willing to eat, shower, dress and sit calmly, they move from the psych ward to Division 2, just across the road. In one room of that facility, a group of inmates is standing by the television while 40 or so others mill about a row of bunks. Three of them say they came to the county jail to get back on their medication after their local clinic closed. "Sometimes I would even commit a crime just to make sure I would get my meds," says inmate Joseph DeRiggi. "Here, there's a little more understanding because they know us: 'OK, DeRiggi, we know what you're on. You're good.' That's just the way it is." As Dart makes his way through Division 2, he pauses to say hello to many of the inmates he recognizes. They cycle in and out. Dart stops at the bunks. His frustration is palpable. "Here you have a population clearly identified as mentally ill, and you're releasing them to the street with nothing," he says. "This isn't left or right, conservative or liberal talking. What do you think is going to happen?" Dart is a former prosecutor. He wants criminals punished. But he says he had no idea when he took the job of sheriff that he would also become the state's mental health provider. While he's talking, a man in the back of the room starts walking in circles. He's saying he's God, and that he's going to make everyone disappear. Now the other mentally ill inmates around him are getting agitated. Three officers with mental health training slowly surround him. They don't say anything; they just nod their heads, agreeing with him. On cue, the officers start walking, and the inmate instinctively starts walking with them. He doesn't know it, but he's headed back to the psych ward. Dart barely pauses. He sees it every day. He says he understands that money for community health centers is tight. But he says doing it this way is costing more. "Clearly, our society had determined that the state-run mental hospitals were abhorrent, that, my God, our society cannot tolerate this, we're much more advanced than that," Dart says. "I just find the irony so thick that that same society finds it OK to put the same people in jails and prisons." But then he shakes his head and changes his mind. "I know people care," he says, pausing. "I don't think they know." Fifty years ago, this country saw a major change in treatment of the mentally ill. States shut down insane asylums in favor of community mental health centers. Patients were released to live independently. Over the past decade, though, states have cut billions from their mental health budgets; clinics across the country have shut down. The result is thousands of mentally ill people funneling in and out of the nation's jails, locked behind bars and institutions ill-equipped to help them. As NPR's Laura Sullivan reports, nowhere is this more apparent than in the nation's largest jail - the Cook County Jail, outside Chicago. LAURA SULLIVAN, BYLINE: The Cook County Jail is a sprawling complex of dismal, gray buildings. With 10,000 inmates, it's a small city. Except here, at least a third of the people are mentally ill. This jail has been on the forefront of this issue with its programs and efforts to handle mentally ill inmates. But if you ask anyone here, even this jail is barely managing. SULLIVAN: Sheriff Tom Dart runs the place. SHERIFF TOM DART: I can't conceive of anything more ridiculously stupid by government than to do what we're doing right now. SULLIVAN: You can see the problem every morning, in the intake center, where 250 new inmates arrested overnight are stuffed into bull pens. UNIDENTIFIED JAIL WORKER: Give me 50. Number 50, where you at? ELLI MONTGOMERY: I'm going to be worried about everyone on the ground right here, because the majority of them are going to have psych histories. SULLIVAN: Elli Montgomery is standing in front of the cages. She's the deputy director of mental health policy for the sheriff's office. She and her staff screen all the inmates. Forget the hostile, angry men at the front, bickering with jail staff. It's the men in the corners that interest her - men who come to jail and fall asleep. MONTGOMERY: You know, I'm kind of curious about this guy in the blue. Now, is he dazed because he's on drugs, or is he dazed because the voices in his head are louder than what's happening around him? SULLIVAN: One inmate after another. One man tells her he's going to kill himself because he thinks he's already dead. Another guy explains that the voices tell him to hurt people. MONTGOMERY: To walk in and feel like every other person I'm interviewing be mentally ill on any given day, to me is - I can't wrap my brain around it. It is staggering, what we're really dealing with. SULLIVAN: Most of these men are here on minor offenses. They're picked up by police for acting out, sleeping in abandoned buildings, possessing drugs. They're people with nowhere to go, and nowhere to get medication. Some will stay for a few days; some, for a few weeks. But statistically, almost all of them will be back. While they're here, the jail's responsibility is to keep other inmates from hurting them, and them from hurting themselves. But jail staff say what really happens deep inside this jail is a far cry from actual treatment. SULLIVAN: Dr. Nneka Jones Tapia is head of mental health for the jail. She pulls open a door inside a large, gray building. This is the women's psych ward, a place rarely seen by the public. SULLIVAN: Inside, there's a long, sterile hallway of green doors with little, square windows. At the end is a community area, where 20 women are sitting in chairs. Some are rocking; some are pulling out their hair. Many are staring into space. TAPIA: You see people who are so profoundly ill that you understand that this is not the place for them. SULLIVAN: But here and throughout much of the country, there's nowhere else for them to go. City and state governments have cut funding for mental health services nationwide. Here in Chicago, facing budget shortfalls, city officials closed six of the area's 12 mental health clinics in the last three years. State officials closed three of the area's state hospitals, and private clinics are struggling for funding. Without medication or counseling, these inmates wind up in front of police. They're brought here. And here can look an awful lot like the past. KENYA KEY: It's a very basic room, just four walls. The walls are padded. SULLIVAN: The jail's chief psychologist, Kenya Key, steps inside a small, dark room behind the community area. It has a drain and a light - nothing else. KEY: It's never used as punishment. The purpose of it is to decrease stimulation. SULLIVAN: There's nothing to write with in this room, but the walls are covered in writing; slurs written with blood from fingertips, or scratched into the walls with fingernails. SULLIVAN: ...is what's the most disturbing. And the fact that they're all mostly scratched into the door, as if they're trying to get out. SULLIVAN: It's a little overwhelming. KEY: ..again, it's - certainly, the majority of the patients that are put here are in a state of very high agitation and escalation. It is a forced intervention to help the patient de-escalate. SULLIVAN: In the men's psych ward down the hall, the scene is similar. Some men are locked into rooms, where they pace back and forth for hours in smocks. One man is wearing just a blanket. One was tied down in an empty room during the night with leather straps. They're just now taking them off. What are the leather restraints? KEY: Full, leather restraints are used when a patient does not respond to any other intervention, which means they are literally, restrained to the bed. SULLIVAN: Officials acknowledge what's happening here is reminiscent of mental asylums of the last century. But they say the only other option is to lock the mentally ill in solitary confinement for weeks on end - this is, after all, a jail. And this is one of the only in the country with doctors and nurses, psychologists and correctional officers trained in how to handle psychotic episodes. And there are rules. Inmates can only be forcibly medicated with a doctor's orders. Leather restraints and padded rooms have time limits. Still, Sheriff Dart says he's confused by the compliments he hears from other jail administrators. DART: On the one hand, they're speaking so highly about what you're doing. But it's depressing as hell when they're telling you, you're the leader. And I was like, wow, I feel as if I'm doing the bare minimum - and we're the leaders? No. This is not good. SULLIVAN: The confusion about what is supposed to be happening in this jail is apparent. Correctional officers often switch between calling the men inmates and patients in the same sentence. Once inmates are willing to eat, shower, dress and sit calmly, they can move to Division 2, just across the road. In one room of that facility, three inmates are standing by the television while 40 or so others mill about a row of bunks. JOSEPH DIRIGGI: Hi, Laura. Nice to meet you. SULLIVAN: Jail inmates Joe Edwards, Joseph DiRiggi, and Augustus - whose last name we can't use because his case is pending - used to go to a local mental health clinic for counseling and medication, before it closed. DIRIGGI: What I had to do was basically come to county, get my meds. And sometimes, you know, I would even commit a crime just to make sure I got my meds. SULLIVAN: When you say come to county, you mean to county jail. DIRIGGI: Yeah, to the county jail. A lot of us feel that way because our meds are so hard to get. We can't just go say hey, I need Trazodone; I need Valium; I need Klonopin. Wait a minute, we can't give you that. What do you mean? I've been on it for 30 years. Well, what program were you at? Well, now it's closed. Here, it's more a little understanding because they know us. JOE EDWARDS: Yeah, that's the reality of it. Because if you are a frequent flier and they know you, your medications are given to you right then and there. SULLIVAN: But jail is an expensive place to get medication. It costs almost $200 a night to house a mentally ill person here. Health clinics cost a fraction of that. Plus, their cases clog the courts with largely minor offenses. That lengthens jail time for everyone. The average stay is now eight days longer than it was a few years ago, and that is costing county taxpayers $10 million more every year. DART: Hey. Long time no see, man. UNIDENTIFIED JAIL WORKER: Yeah, how you doing? SULLIVAN: As Sheriff Tom Dart makes his way through Division 2, he sees many inmates he recognizes. They cycle in and out. He stops at the bunks. His frustration is palpable. DART: Here, you have a population clearly identified as mentally ill, and you're releasing them to the street with nothing. This isn't left or right, conservative or liberal talking. What do you think is going to happen? SULLIVAN: Dart is a former prosecutor. He wants criminals punished. But he says he had no idea, when he took the job of sheriff, he would also become the state's mental health provider. While he's talking, a man in the back of the room starts walking in circles. SULLIVAN: He's saying he's God; says he's going to make everyone disappear. Now, the other mentally ill inmates around him are getting agitated. UNIDENTIFIED INMATE #2: I'm God. I'm Jesus Christ. I'm Jesus. You want to see me in Puerto Rico? You see I'm Puerto Rican? You see I'm Jesus? SULLIVAN: Three officers with mental health training slowly surround him. They don't say anything. They just nod their heads, agreeing with him. On cue, the officers start walking, and the inmate instinctively starts walking with them. He doesn't know it, but he's headed back to the psych ward. Sheriff Dart barely pauses. He sees it every day. Dart says he understands money for community health centers is tight, but he says doing it this way is costing more. DART: Clearly, our society had determined that the state-run mental health hospitals of the '40s and '50s were abhorrent; that my God, our society cannot tolerate this, we're much more advanced than that. And I just find the irony just so thick that that same society now finds it OK to put the same people in jails and prisons. SULLIVAN: But then he shakes his head, and changes his mind. DART: I know people care. I don't think they know. SULLIVAN: This morning, 250 or so more people sat in the bullpens at the Cook County Jail. At least a third of them were mentally ill.